4R Animal Shelter – A voice for those who have none. Charley was not the first rescue, but he was and is the one who has touched many hearts. An older, 40+ years old, mini Stallion, Charley was turned over to 4R with the promise that he would live out his years with 4R. We strongly stand by that promise. Charley represents the best of rescuing. Both that the previous owner understood that Charley needed more that they could provide and the recovery he made under 4R care. A photo of Charley when he first arrive. Severely underweight, his long winter coat hid many sores and raw areas. 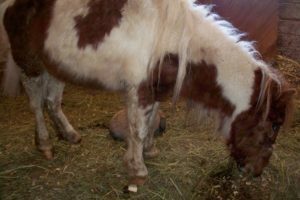 His front hooves were so long that instead of growing straight and curling up in front, they were growing sideways and he was walking on the outside wall of his hooves. 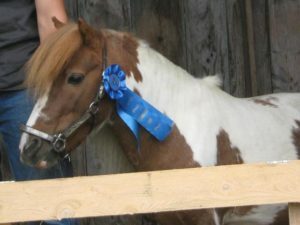 His mane and tail were matted with burrs and tangles. His right eye was oozing liquids and yellow secretions, cause acidic burns on his face. The eye had become punctured at some previous time and was not attended by a Veterinarian, resulting in prolonged pain. The veterinarian 4R took him too said it was months of severe pain but eventually the eye nerves died and he was pain free, though blind. His teeth were so neglected that in order to float them, a grinding process to return a horses teeth to usable condition for them to grind their food, that he had to be sedated. The veterinarian had to use bolt cutters while Charley was sedated to snip off the tips of his molars to allow room for the teeth to be worked on. 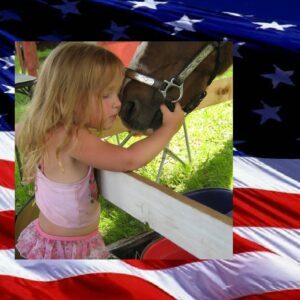 Today Charley loved by many and gentle with all. This two year old is following Charley around, trying to brush him. 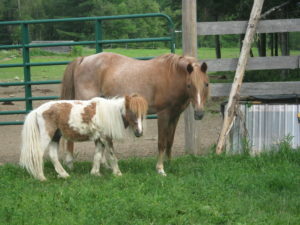 Charley also has his favorite pony mare, Lilly. He stays with her at all times. 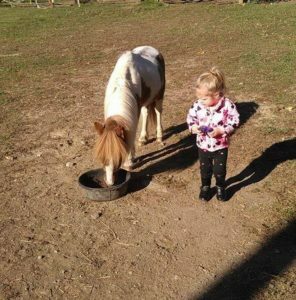 Tells her when to come to water and warns any other horses to leave her alone.